Since 1985 in Oldenburg/Germany. 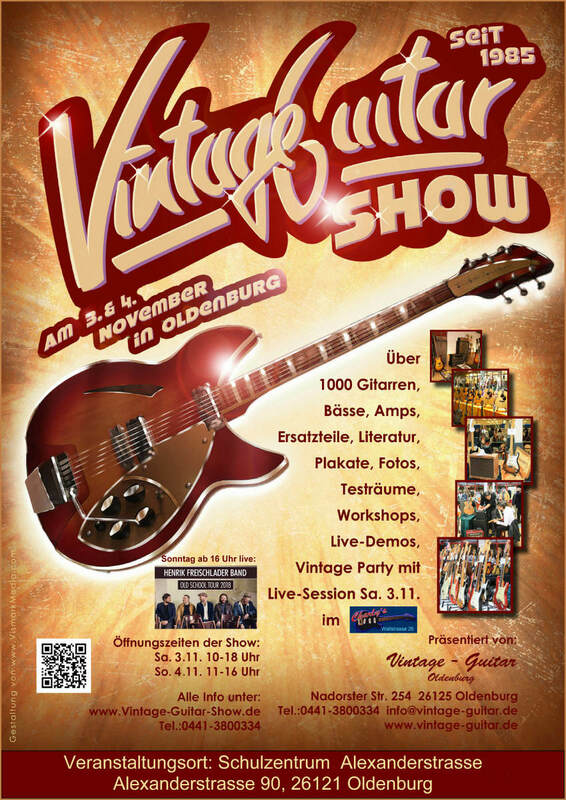 Germanys largest and most important Vintage Guitar Show. In the year 2019 on: Saturday 2ND from 10am untill 6pm. Load-in for exhibitors on friday 10th from 6 - 10 pm More than 1500 guitars, basses and amps,spareparts, books. Workshops and demonstrations. Vintage-party with live-session on saturday evening in the live-club 'Charlys Musikkneipe'. Vistors can take up to 2 guitars/amps per person in, any more instruments will be charged with € 5 per piece. For security reasons we will have a control servive at the entrance and at the exit and a video surveillance. Please note that in Germany and the EU it is not allowed to trade or display any guitar with parts of brazilian rosewood without a CITES-certification. You may bring in this kind of guitars for a fee-based expertise and we will help you with the application for the CITES-papers. More infos about this coming soon! Here some official informations about brazilian rosewood..
Clearly - the vintage guitar show lives of e-Gits and electric basses - not to mention the vintage amps quite. But it is enough 'Akustik' material there to make the scene of the singer / songwriter and music world's attention. Since two year the show takes place at a new location: School Alexanderstasse 90, 26121 Oldenburg.